"Don't confuse this Facebook thing with who you really are." STX Ent. has debuted the first official trailer for a comedy titled Second Act, the latest feature film from veteran comedy director Peter Segal (Tommy Boy, Anger Management, 50 First Dates, The Longest Yard, Get Smart, Grudge Match). 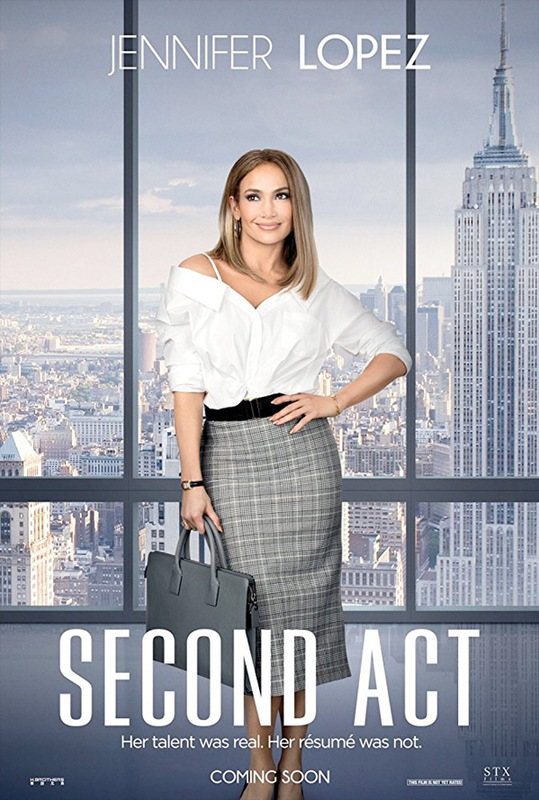 Second Act is about a big box store worker named Maya, played by Jennifer Lopez, who reinvents her life and her life-story and shows Madison Avenue what street smarts can do. My eyes are rolling already just reading this description. Just wait until you see the footage in the trailer, oh yes, it's even worse. The cast includes Milo Ventimiglia, Vanessa Hudgens, Leah Remini, Charlyne Yi, Freddie Stroma, Treat Williams, Dave Foley, and Larry Miller. This is definitely not for me, but maybe some others will perhaps enjoy it. Second Act is a comedy in the vein of Working Girl and Maid In Manhattan. Jennifer Lopez stars as Maya, a 40-year-old woman struggling with frustrations from unfulfilled dreams. Until, that is, she gets the chance to prove to Madison Avenue that street smarts are as valuable as book smarts, and that it is never too late for a Second Act. Second Act is directed by veteran American filmmaker Peter Segal, director of many comedies including Naked Gun 33 1/3, Tommy Boy, My Fellow Americans, Nutty Professor II: The Klumps, Anger Management, 50 First Dates, The Longest Yard, Get Smart, and Grudge Match previously. The screenplay is written by Justin Zackham and Elaine Goldsmith-Thomas. STX will release Segal's Second Act in theaters everywhere starting November 21st late this fall. Anyone interested in this one? Thoughts?